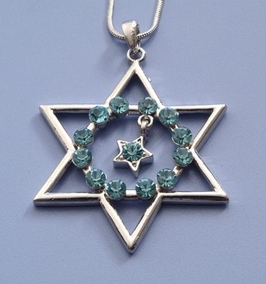 A Jewish Star of David Necklace, made in Israel. The evolution of the six-pointed Jewish star, the "Magen David," literally the "Shield of David." also known as the hexagram, or more rarely, *Solomon's Seal, is long and complex. Although it is now the most common and universally recognized sign of Judaism and Jewish identity, both within and outside of the Jewish community, it has only achieved this status in the last two hundred years. Before that it was chiefly associated with magic or with the insignia of individual families or communities. Yet despite its equivocal history, Jews have long been attracted to this design and have sought to ascribe to it venerable origins. In our own day, its universal Jewish popularity, especially as the symbol of the State of Israel, has made the question of its origins moot. Today, the Star of David is the most popular and universally recognized symbol of the Jewish People. In his seminal work entitled the Star of Redemption (1912), Franz Rosenzweig framed his philosophy of Judaism around the image of the Jewish star, composed of two conceptual "triads," which together form the basis of Jewish belief: Creation, Revelation, and Redemption; God, Israel, and World. 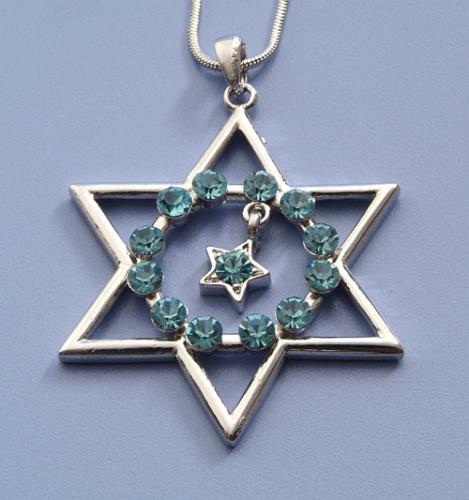 On the popular level, Jews continue to use the Jewish star as it was used for centuries: as a magical amulet of good luck and as a secularized symbol of Jewish identity.